What happens when one of the world’s most esteemed Champagne houses brings its best bottles to dinner at one of Hong Kong’s legendary luxury hotels? 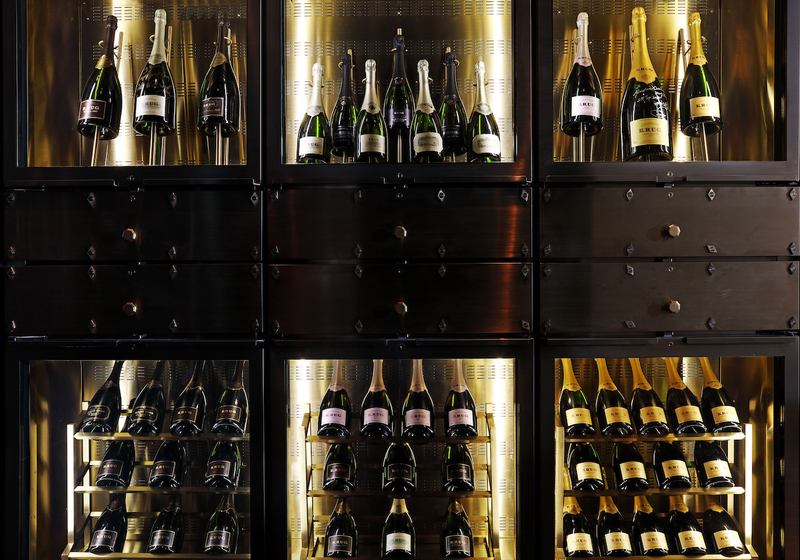 The answer is at The Krug Room. 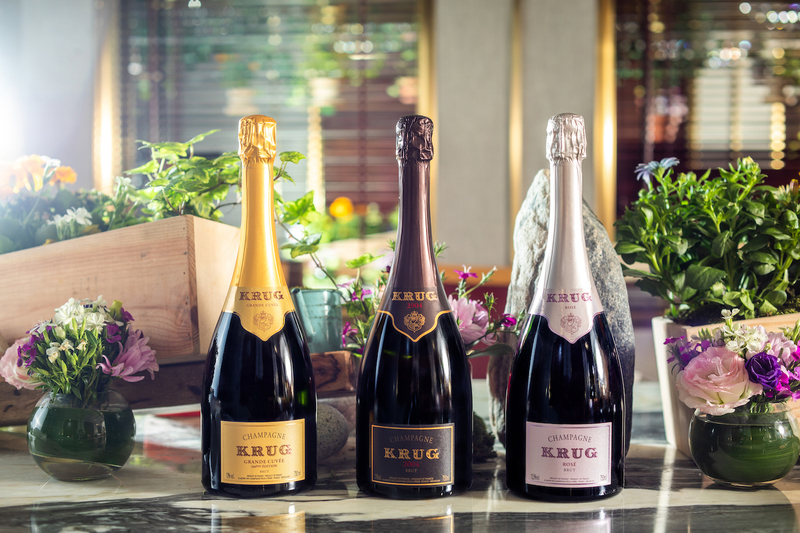 Hidden away on the first floor of the Mandarin Oriental, The Krug Room is said to be one of the city’s best kept secrets offering an exclusive dining experience like no other. After all, it is the last remaining room of its kind in the world. Here, guests are led discreetly through a series of doors and into an intimate space that can only entertain 12 diners at a time. 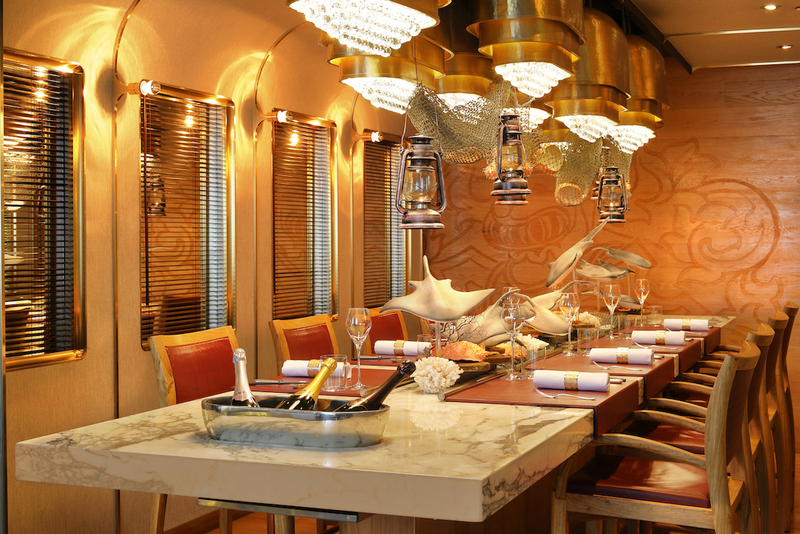 The room is designed to resemble the interior of a luxury train carriage, complete with views of the working kitchen, and (wait for it oenophiles) houses one of the largest collections of Krug champagne in Asia. 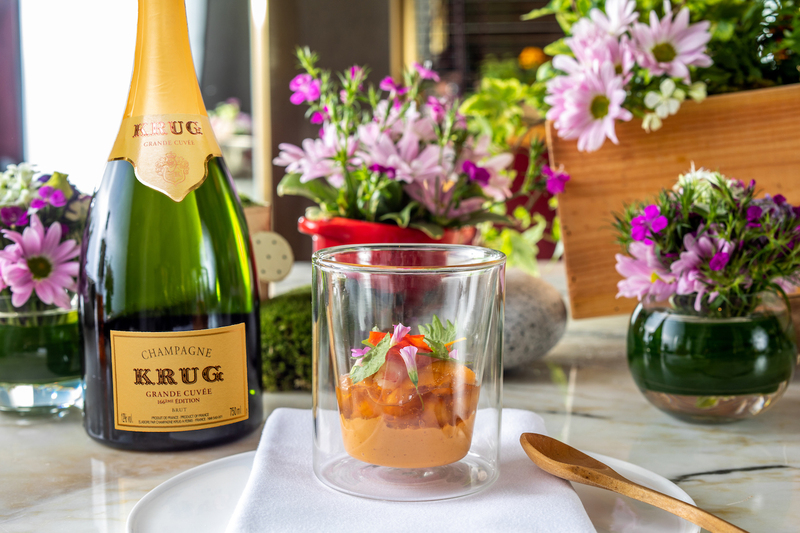 Of course, gourmands are not forgotten as they buckle up for a culinary journey driven by the hotel’s Executive Chef Robin Zavou, who serves up his elegant yet playful cuisine, paired with Krug’s finest cuvées. 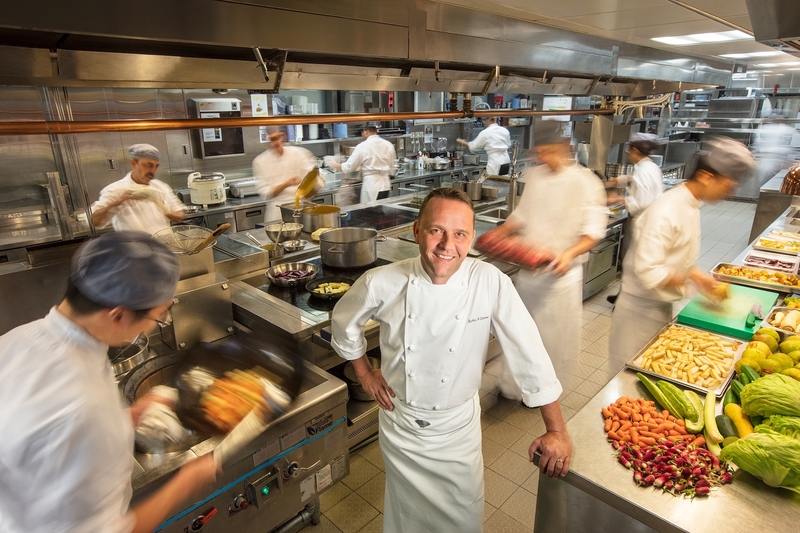 Leading the Krug Room kitchen, as well as nine other renowned restaurants and bars at Mandarin Oriental, Chef Zavou has an incredible background that spans the Shangri-la Hotel Group in Hong Kong and Singapore, on top of Michelin-starred restaurants across the UK such as L’Ortalon in Berkshire, Le Manoir Aux Quat’ Saisons in Oxfordshire, and New Angel (now The Angel) in Dartmouth. 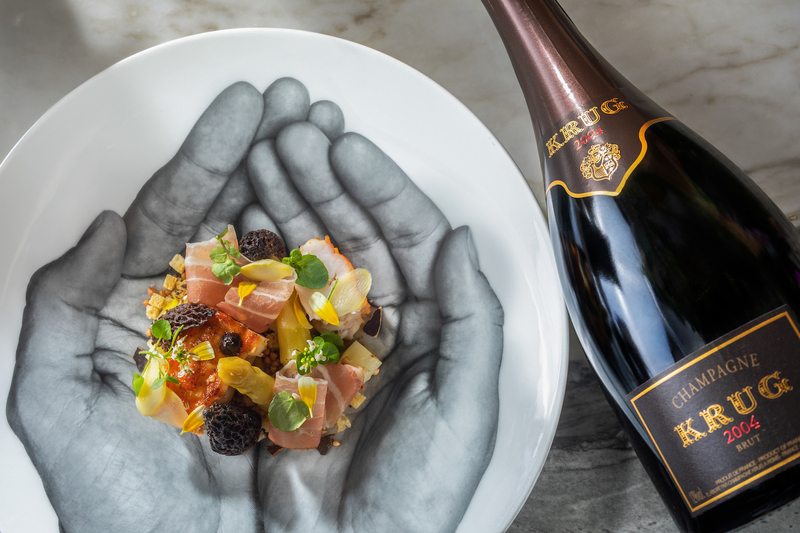 Chef Zavou, a huge Krug enthusiast himself, has been with The Krug Room for almost three years and looks to create dishes that complement the unique nuances of the champagne, but also shine a light on the season’s best produce. And this spring is no exception, as Chef Zavou delivers a symphony of flavours from land and sea for the new 10-course menu. The spring menu begins with a glass of Krug Grande Cuvée 166ÈME Édition — the 166th release since the foundation of Maison Krug in 1843 — which is an elegant blend of 140 wines from 13 different harvests between 1998 and 2010. It’s bright in acidity with toasty brioche on the nose, but it’s the fresh lemon overtones that cut through the rich savoury snacks. In which a highlight is Chef Zavou’s surprising take on “KFC” or Korean fried crab in this case, as Alaskan king crab replaces chicken and is spiced with an addictive Korean chilli sauce, white sesame and black sesame paste in a crunchy tempura batter. The fruity accents from the champagne continue to lend a much needed zing for the Japanese ebi, with expressive flavours that bring out the umami of sea urchin custard, soy jelly, garam and shiso. 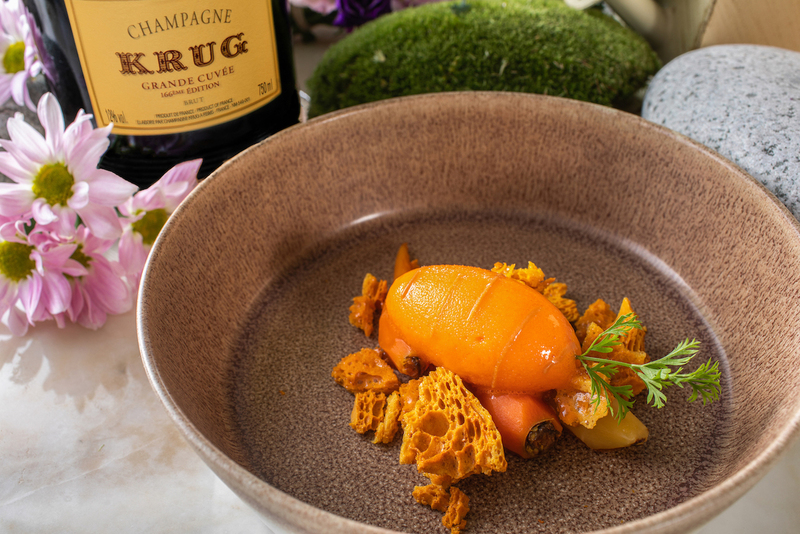 Other spectacular pairings include Krug 2004 and the best of spring vegetables. Crafted from a selection of the year’s most vibrantly fresh wines (hence its nickname ‘luminous freshness’) the vintage is bright but well-balanced with warm honey that gives way to plenty of citrus and floral notes. It whets the appetite for the season’s Asparagus, lightly poached in konbu butter and served with crispy buckwheat, slices of speck and, roasted marron — a fresh-water shellfish, with white mushroom and morels. 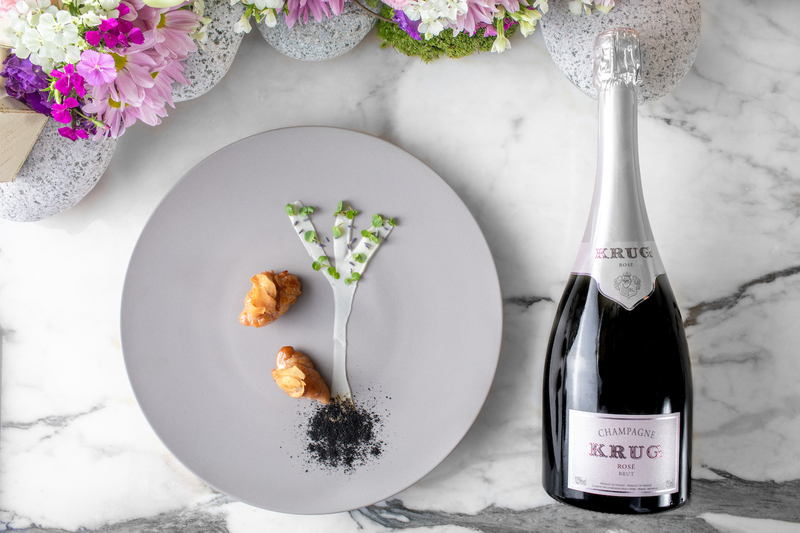 But the start of spring wouldn’t be quite as fresh without rosé, and so the Krug Rosé 20ÈME Édition is a blushing toast that is welcome with any dish. This time, its partner is the creamy Veal sweetbread that sets the tone with a deep sweetness from molasses, while French garlic, spring leek, fresh morel and roasted onion provide an intense base of flavour to the aromatics of orchard blossom and juicy fruits in tune with the vivacious rosé. 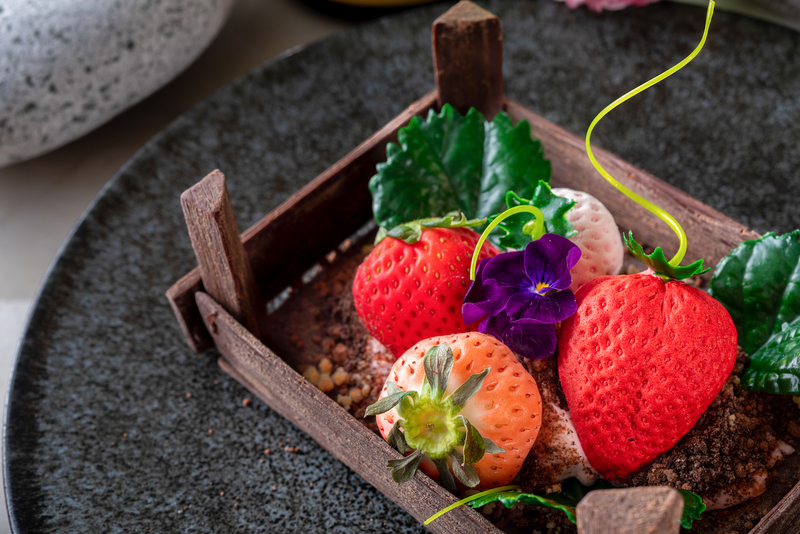 The finale of impressive desserts also await with Carrot, an artistic impression of carrot sorbet, confit carrots and honeycomb, along with the stunning Strawberry treat that uses pink Japanese strawberries and rosé in fresh, ice-cream and mousse form. This invites a chilled glass of Krug Grande Cuvée 160ÈME Édition as it delivers a fresh bouquet of peach, apple and grapefruit before revealing its elegance with fine bubbles. Krug Soloist to Orchestra (6 guests or above) for HK$5,888 + 10% per guest includes 1 glass of Krug Grande Cuvée 166ÈME Édition + 1 glass of Krug Clos Du Mesnil 2003 + 1 glass of Krug 2004 + 1 glass of Krug Rosé 20ÈME Édition + 1 glass of Krug Grande Cuvée 160ÈME Édition. Individual bookings are available on Thursday and Saturday at The Krug Room.